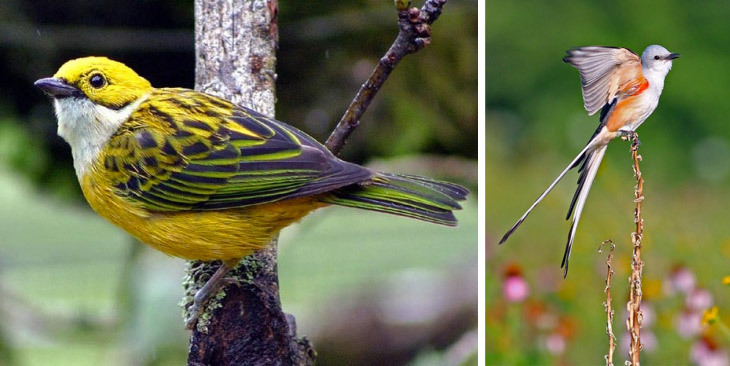 Many birdwatchers think that in order to visit a destination and find many new species to add to their life bird lists, they will need to trudge for miles and miles through swamps, forests, jungles, and muddy trails. 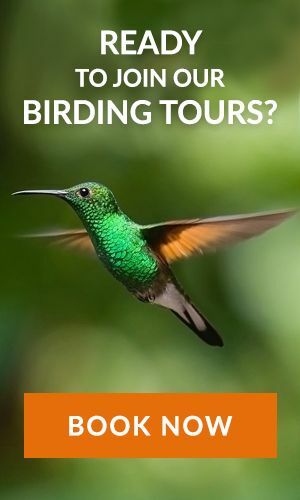 Costa Rica is such a special place for bird watching because it is easy to create a birdwatching tour vacation for the birder and the non-birder in the couple, family or group. Last week, my husband and I left our home in the Central Valley of Costa Rica to visit the Guanacaste beach area, and then make a stop at the Los Angeles Cloud Forest in San Ramon. We are both avid birders, so yes, of course, we were planning on some bird watching, but this was the first get-away we have had together for a while, so we also wanted some downtime for beaches, pools, and cocktails. Like normal, we hugged the dogs goodbye, re-checked for binoculars, wished our dog sitter good luck (10 dogs, lots of work), and set out northwest to the Pacific Coast and the beautiful Playa Conchal area. We generally keep our eyes to the skies, even as we leave our house. This was not planned to be a birdwatching tour, per se, but being passionate about birds, and since it was migration time, we were hoping to see some new species to add to our year bird list. 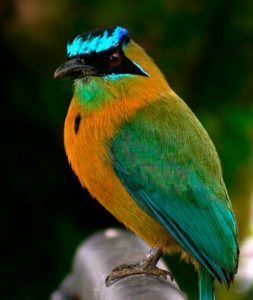 Many birdwatching tours in Costa Rica will skip over Guanacaste in favor of the Central and Southern Pacific regions, but if you have done the Central Pacific, and the Osa Peninsula, your next birding trip to Costa Rica should include Guanacaste. Back to our trip, we bounced along in our good ol’ Toyota Four Runner, down the unpaved road taking us from our house to the main street outside our little town. We spotted turkey vultures, black vultures, rufous-naped wrens, yellow warblers, tropical kingbirds, Kiskadees, Steely-vented hummingbirds, and a short-tailed hawk (we were not even 1 mile away). We continued along the highway, spotting a lot of vultures of course, and a roadside hawk, until finally, we reached the coastal town of Puntarenas. There is a small mud-flat there, we stopped for a quick look and found a couple spotted sand-pipers but nothing else. It is a 3.5-hour drive from the Central Valley to Guanacaste, so we decided to keep moving, as we wanted to make it to the beach by sunset. The drive was uneventful, we did see a troop of Howler Monkeys in the trees overhead, and several flocks of orange chinned parrots (signaling the start of the dry season in Costa Rica), but for the most part, there were what we call “the usual suspects.” Kiskadees, tropical kingbirds, vultures, roadside hawks, grey hawks, cattle egrets, great egrets, and social flycatchers. Playa Conchal: Admiring The Birds and Wildlife Too! Arriving at our hotel at Playa Conchal, we were happy to see the sprawling golf course (great place for bird watching) and to find a map of the trails at the on-site reserve. In the morning, we planned to rise early and check out the property in order to see what we might see in the area. We did take the late afternoon to have a few cocktails, take a lovely swim in the clear warm water at Playa Conchal, and watch the sunset beautifully over the Pacific Ocean. Just walking around the resort property that afternoon, we were impressed with the wildlife we encountered. We saw Variegated squirrels, Coatimundis (with babies, so cute), white-faced capuchin monkeys, howler monkeys, an armadillo, and lots of iguanas. The birding was great too because the resort has done a great job of maintaining lush green areas. The hotel also borders a 96-acre private wildlife reserve that includes a dry tropical forest, an estuary, and a mangrove swamp. 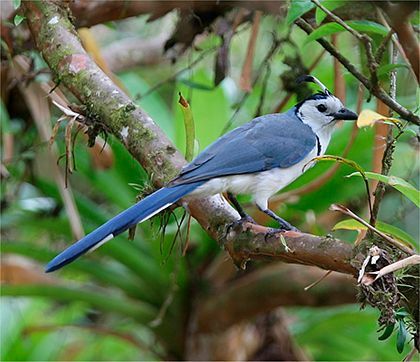 This diverse array of habitats creates a fantastic place for birdwatching in Costa Rica. Our first morning, we set the alarms for 5:00 a.m. (it gets light about 5:30) and were greeted by the hoots of owls, right outside our terrace door. Upon investigation we found two Pacific Screech Owls perched just a few feet away. That was a great omen to start the day. We headed through the grounds of the hotel, towards the golf course, and saw Clay-colored robins, white-winged doves, boat-billed flycatchers, and the gorgeous streak-backed oriole (to name a few). We continued to the golf course, and at the first pond, we were happily surprised to find two lovely Lesser Scaups. They were so pretty in the early morning sunlight. 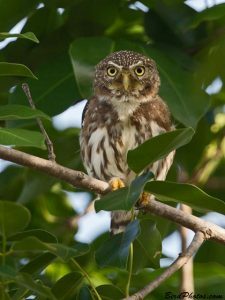 Under a large Guanacaste tree, we spied several double-striped thick knees and at the second pond a Ringed Kingfisher and a Tri-colored Heron. Next, we took a trail into the wooded portion of the reserve. There were Scrub Euphonias, a Thicket Tinamou, Lesser Greenlets, a Black Headed Trogon, Banded Wrens, and many Melodious Blackbirds. The trail looped us around to the paved road, which turned out to be successful as we encountered several mixed flocks. Tanagers were everywhere, Blue & Grey, Summer, Western, as well as a cute Brown Crested Flycatcher, Groove-billed Anis, Rufus Capped Warblers, Squirrel Cuckoos, and a long-tailed manakin. Continuing down to the beach we first visited the river mouth. There we found the spotted sandpipers, a Yellow Crowned Night Heron, Great Egret, Little Blue Heron, and mangrove swallows. Along the beach, we enjoyed both the Elegant and Royal Terns, and lots of Brown Pelicans. We had a very special sighting too, a White-Necked Puffbird, perched on a bare limb, right in the open. We had a great look. We only spent about 2 hours around the hotel, on the trail, and then on the beach and we logged about 100 species. Imagine a day like that, at a beach hotel, that is why Costa Rica Birdwatching is so great. The following morning, we left central Guanacaste to the Northernmost peninsula, The Papagayo Peninsula. Our hotel was located at the beach surrounded by the dry tropical forest typical of Guanacaste. Again, we chose well because the combination of resort amenities, beautiful pool and spa, natural beach, and the clear water of Culebra Bay PLUS the surrounding forest made us know we were in for a great time relaxing and bird watching experience. It was a typical hot Guanacaste afternoon so our first stop after check-in was the swimming pool. No sooner had we gotten in the pool when a huge troop of white-faced capuchin monkeys visited the pool. There were tiny newborn babies, clinging to their mamas, and juveniles chattering and playing with each other, jumping through the trees, chasing each other everywhere. It was really cute. I guess that one of the youngsters thought the pool looked pretty good, as he came to the edge of the infinity pool, and lay down, dangling an arm and a leg into the cool water. He lay there, looking at us like, “Yeah? What’s wrong with this?” “I’m just doing what you’re doing.” It was incredible. We were also visited by toucans, white-fronted parrots, Brown-hooded Parrots, and an Osprey. It was a great start to our visit on the Papagayo Peninsula. We spent the next day mostly relaxing by the pool. From the pool, we Coppery Emerald Hummingbird, a Great Crested Fly Catcher and a Rose-throated Becard. To make the day even better, I spied something moving mid-canopy, at first, I thought it was a monkey, but WOW, it was a Tamandua (Anteater). That was really special. After two days enjoying the sun of Guanacaste, it was time for us to move on to our last stop, the cool misty cloud forest of the Los Angeles Reserve, just outside the town of San Ramon. We were greeted by a blanket of mist, and temperatures that dropped rapidly. It felt good to be in the cool fresh air after the heat of Guanacaste. The gardens at our hotel were alive with hummingbirds, sparrows, and wrens. The Violet Sabrewing (the largest hummingbird in Costa Rica) zoomed by, the charming little Bananaquits chirped in the verbenas, and the Mountain Elaenias came to check us out. When the fog got too dense and the afternoon too dark, we retired to the hotel lounge and sat in front of a roaring fire enjoying a glass of wine and one of our favorite typical dishes, Ayote Soup (Squash soup). We planned for an early morning walk into the cloud forest, so we went to bed early. Our quaint, rustic room included our own fireplace. We lit a toasty fire and fell asleep to the sound of the wood crackling, it was heavenly. The rain was our morning alarm, but we decided to brave the conditions and at least get an hour in the Cloud Forest. So, ponchos on, we made our way down an easy path through the mystical, magical cloud forest. There is no way to fully describe the cloud forest. You simply must experience it. The lushness, the depth of the greens, the smell of the earth, the plants and vines, and trees and the birds, Oh the birds. We only had about 30 minutes before the deluge came but, in that time, we spotted a Dusky Antbird, Red-Faced Spinetail, Rufous-Tailed Jacamar, Spotted Woodcreeper, Chestnut-sided Warbler, Wilson’s Warbler and much more (see full list below). We could have easily spent hours exploring the area but hard rain and the need for breakfast called us back to the lodge. With an unfavorable weather forecast upon us, we decided to pack it up and head back to the Central Valley. It was an amazing trip, and a great reminder of how amazing bird watching in Costa Rica truly is. 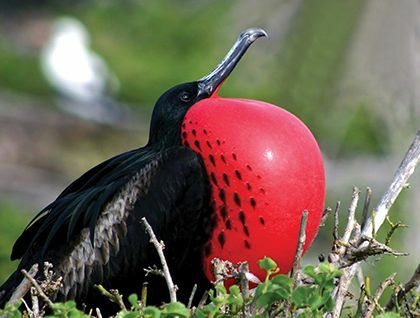 Visitors can experience several different climate zones, and see a huge array of birds, even on a 5-night birding tour to Costa Rica.